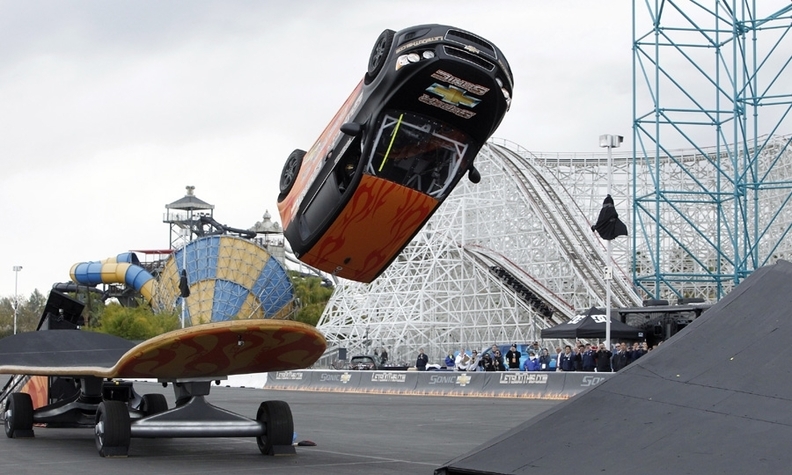 Professional skateboarder and MTV star Rob Dyrdek did something with a Chevy Sonic on Saturday that's never been done before: a kick flip. That's what they call it when a skateboard -- or a car -- corkscrews off a ramp, landing back on four wheels. The stunt was part of a Chevrolet ad campaign that started with the new hatchback driving out of a plane with a parachute like a skydiver. The Sonic then rolled off a 100-foot tower with a bungee cord attached. Dyrdek is part of MTV's Fantasy Factory TV show, which involves he and his friends doing stunts at his warehouse. The car got a few modifications for the jump, including a roll cage, racing seatbelts and upgraded shocks to absorb the landing. The fuel tank was modified to hold only a few gallons, and the battery was moved inside the roll cage. Other than that, the Sonic was stock. Dyrdek trained with drivers from the International Stunt Association before doing the trick.